The Bible says, “Honour your father and mother” (Ephesians 6:2) Jesus was and is the Living Word. How could He break His own word? Hence, He entrusted His mother into the care of the disciple that loved Him the most - Apostle John. This reveals the kind of intimacy that John had with Lord Jesus. You and I too need develop this kind of intimacy with the Lord so that the Lord can share the things which are on His heart. According to Nicephoras’s Ecclesiastical History (book 2, chapter 3), Mary lived with John at Jerusalem eleven years and then died. Other historians say she went with him to Ephesus. There are many, who are well settled in life but they don’t even care to support their own father and mother in their old age. They conveniently forget the sacrifices their parents have done for them. The Lord has promised to prosper those who honour their parents. Sometimes it is as simple as a regular phone call—and please answer their calls. It makes their day. 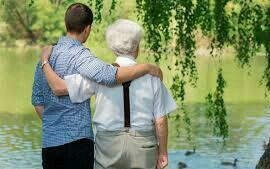 Do whatever little you can to honour your parents in their old age and you will reap blessings that will outlive you. Also, if Jesus could provide for the needs of someone when He was in His moments of His deepest weakness and humiliation, how much more can he provide for needs in His present exalted state! "My God shall supply all your needs according to His riches in glory in Christ Jesus" (Philippians 4:19). The risen Christ is so full of glorious riches that none will go empty.